Jo Who? 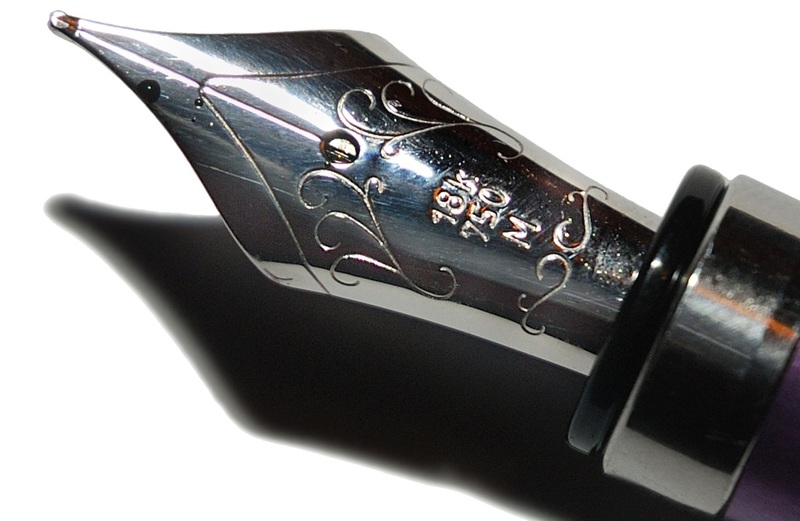 There are few nib manufacturers left in the world, and even fewer who sustain the art of making a writing tip from gold. A few famous Italian brands, a couple of well-known German ones, and three Japanese pen names make their own gold nibs, and there are a few highly-bespoke goldsmiths like Romillo, but apart from these notable exceptions almost all the other gold nibs you’ll find on sale these days are made in Germany, by Bock or JoWo. Distinguishing between the two is a matter of personal taste, but opinions can be quite firmly held; if you’ve ever witnessed camera obsessives arguing the relative merits of Nikon and Canon and noted the ‘immovable object vs. unstoppable force’ trap such conversations tend to fall into, you’re probably in about the right territory. In truth, they are both excellent suppliers of gold nibbage, and since you’ve already seen what Bock can offer on United Inkdom (in Kaweco’s Sport and Elite, and the Diplomat Aero), it seems only fair to give JoWo a chance to show what they can do too. So off we go to Heidelberg, ja? Well, indirectly. That’s where they’re made, but they don’t participate in retail sales, so JoWo is not about to take calls from Joe Public; someone has to put in a bulk order. Plenty of pen makers do just that (JoWo is the favoured nib supplier for John Twiss, for instance), and when Pablo ordered a batch for his hand-produced Gimena pens he realised he had more on his hands than he could really make use of right away, so Esther set up the FPnibs.com retail site, turning that over-supply into a business opportunity. This supports the artisan production which Pablo concentrates upon, while making all sorts of tasty upgrades available to the rest of us – with the amusing twist that the nibs come to you from southern Spain, roughly half-way between one of the Pillars of Hercules and the city that Jonah was aiming for when he had an unscheduled whale of a time. You can’t say we don’t give you legendary reviews, now. OK, whet my appetite. It’s near Jerez, too, so you can pick up a nice Fino along with your Fine, if that’s your poison. But steering gently back to the fountain pen world, what first got many scribblers’ attention was the discovery that the standard #5 gold nib fitted the TWSBI 580. As TWSBI have, quite understandably, concluded that the various customs regimes standing in the way rather preclude them from offering an official gold nib upgrade, this should be (and is) a source of considerable excitement. The good news is that it works; fitting it to the TWSBI feed and collar is moderately fiddly, but unlikely to be beyond the reasonably experienced nib-twiddling enthusiast. Scribble’s 580AL, fitted with a rhodium-plated example, is doing heavy duty producing the never-ending Too Many Purples ink project, where the natural flex of the JoWo is winning a pleasantly embarrassing number of admiring glances. Hmm, not bad. What about the smaller TWSBIs? Well oddly enough the Mini and the Eco use a #5 nib too, just a slightly more narrow-shouldered version for aesthetic reasons – and FPnibs.com have found answers to that challenge too. The Eco model only works as a friction-fit so this does require some care to upgrade, but a screw-in collar makes fitting to the Mini model very straightforward. Will it make me fall in love with my neglected Faber-Castell? Probably! If you liked the smoothness of the standard steel nibs but would prefer a bit more of the natural flex which seems to be the key distinguishing factor of JoWo gold nibs, a fix is available. Pablo tested the fit on Scribble Monboddo’s long-suffering F-C Basic, (you can see the video here) but as almost all Faber-Castells use the same screw-in feed assembly the nib which came home has a more suitable vehicle, in the shape of the graceful wooden E-motion – and very juicy it is too. Size isn’t important, but… Yes, they sell the bigger #6 too, and it’s splendid. Scribble has rather shamelessly abused a dark ruthenium-plated #6 by popping it into a Schrade Tactical for a while, and more recently promoted it to a more stately home in the Namisu Nova, but in both bodies it has surprised many borrowers with its soft nature. So, go on then – can we get added flex? Oh come on now, I didn’t expect the Spanish inquisition! OK, OK, sorry, that was a very old joke. But yes, of course you can get added flex, and on request Pablo will do it for you, shaving a little off the shoulders of a #6 to provide plenty of line variation. Pablo’s own video demonstrating this marvel has it fitted to the Fosfor Bangalore, which we reviewed last week, and it now lives happily in a big Karas Kustoms INK. Where do we get these goodies? FPnibs.com, naturally. In the interests of balance we should point out that Esther and Pablo helped out with a bit of a discount so that we could sample the full range, but honestly we’d recommend these anyway. New life for old pens!